My feet are in pain and I don’t know what to do! Most people usually tend to purchase cute shoes or cheap shoes with no support without realizing they are hurting their feet. Most likely you haven’t realized how much you’ve harmed your feet with cheap unsupportive shoes until they hurt. Then, you can’t help yourself from screaming MY FEET ARE IN PAIN! If you suffer from foot pain, arch pain, heel pain, ball of foot pain or plantar fasciitis; keep reading this blog since it may help save your feet from foot pain. Why are my feet in pain and what is causing my foot pain? So if you are tired of constantly shouting, my feet are in pain, it’s time you do something about it! But first, let’s find out what may be causing your feet to hurt. Foot pain can range from mild to severe which can be caused by trauma, disease and/or injuries. In addition, poor biomechanical alignment and unsupportive footwear could also cause pain or discomfort. For example, worn out shoes with not enough support to protect your feet, arches, heels, knees, and back from shock can cause pain from the ground up. Tight shoes that are half to a full size smaller can cause your feet to hurt and can aid bunion growth. Finally, those cute high heels you absolutely have to wear with most of your outfits can also cause pain around the ball of your foot just below your toes. You can usually experience arch pain at the bottom of your foot at any point between your heel and the ball of your foot. Most arch pain is due to strain or inflammation of the plantar fascia which is a long ligament on the bottom of your foot. This foot condition is called plantar fasciitis and is the most common cause of arch pain. Not only can plantar fasciitis cause arch pain but also heel pain. If you frequently experience heel pain, you be suffering from plantar fasciitis. Plus, you may very well know that heel pain can be one of the worst pains you have ever experienced! Usually, it hurts the worst in the morning when you’re getting out of bed and after standing from sitting for a long period of time. When you experience this horrendous pain, you can feel it in your heel or in your arch. Ball of foot pain is frequently associated with metatarsalgia which is pain and inflammation directly below your toes. This area is where you usually place the most pressure when standing and moving, but especially when you wear high heels. You may experience excruciating pain and numbness when flexing your toes just after standing for a period of time. In many cases, women tend feel the worst ball of foot pain after wearing high heels for more than four hours. What can I do to stop my foot pain? Not that you know that foot pain such as arch pain, heel pain, and ball of foot pain often develops from unsupportive shoes, worn out footwear, injury, disease, and trauma; let’s look at some supportive footwear that is great for pain relief. So stop screaming, My feet are in pain! and start shopping for better shoes for your feet and your foot health. 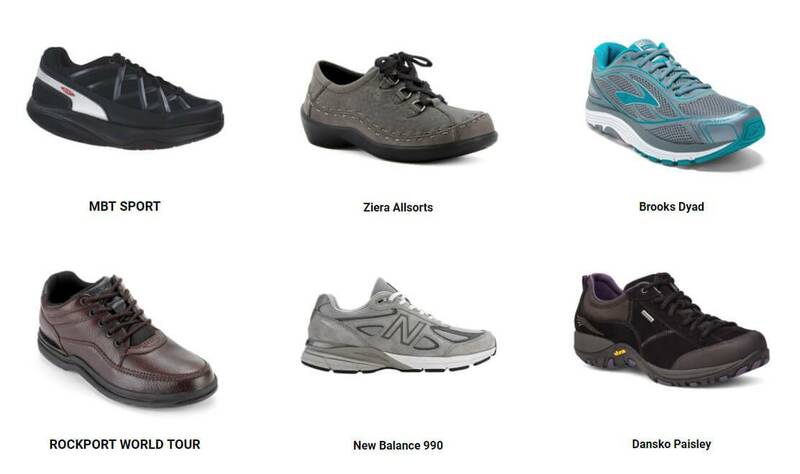 Find below some of our most comfortable shoes with arch and heel support to help keep you on your feet with minimal to no pain! In addition, shop some of the best over-the-counter arch supports for foot pain, arch pain and heel pain. Where to shop shoes and arch supports for foot pain? Come into any one of our stores located in Costa Mesa, Anaheim Hills, Rancho Cucamonga, Riverside, San Dimas, Long Beach, Temecula, La Quinta and Palm Desert, today and shop our shoes and arch supports for foot pain! At Lucky Feet Shoes, we carry many comfortable shoes for pain: sandals, heels, walking shoes, running shoes, casual sneakers, clogs, wedges, flats, booties, and boots. Come and visit us today! If you are looking for shoes and arch supports for foot pain in Orange County, the Inland Empire, Los Angeles County, Temecula or Riverside; we have nine stores to serve you!